PonderWonders: I'll take a BIG cup of self love please! This morning I was awaken with a very important question from a very zany & wise lady. A question probably many of us would not even think of asking..."How is your self love cup today?" I am blessed & grateful to welcome and embrace a new day with such an empowering self-reflecting message and I want to share it with everyone..."Remembering that when you do more of what YOU love to do - dancing, singing, drawing, reading, your heart will sing and the world will be nourished by you!" This got me "pondering" and decided I am worth it! Today I will give myself and the world the gift of taking time for ME! 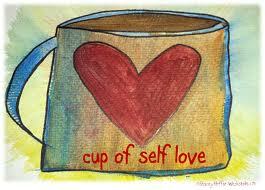 SoI'll take a BIG cup of self love please! How about YOU? Thank you Susan (a/ka/ SARK) for being YOU and asking such a simple yet empowering question! Hope you all have a wonderful & blessed day! On the double, wait!!! On the triple please & keep it coming... <3 Cheers!!! !